Go to you status message app and type in whatever you want to. Then to add a symbol, hold the ALT button on your keyboard and press any number. For instance; ALT+1, ALT+2, etc. ALT+1 will give you a smiley. You can keep trying various combinations of numbers to get different results. Status Symbols is an app that has a wide range of symbols, smilies, arrows, etc. 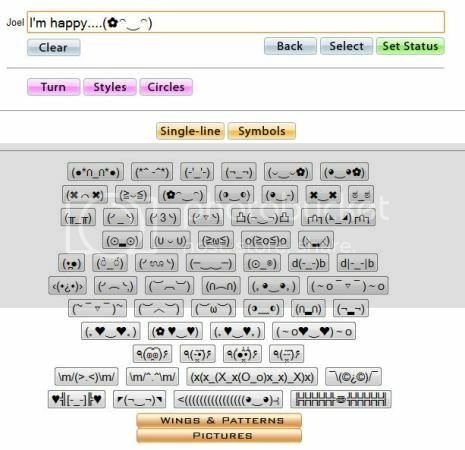 You can create a status message right from the app using various symbols and stuff.